Welcome to Kay's Nursery. Enjoy my presentation of Lakiah. Prototype #2 prototype Gaby Gail sleep by Claire Taylor she is a vinyl doll kit. Vinyl kit with a flesh color cloth body made for 3/4 arms & full legs. There's cotton stuffed inside. The head & inside the body pouches filled with glass beads for the weight and cotton fill. To give a life like. That makes her feel like a real baby when you're holding her. I hope everyone enjoys the pictures. There's a pouches inside filled with glass beads. Of her body and head. Her legs and arms are filled with micro glass beads and stuff with cotton. I used Genesis heat paints, and black. I only use German fork needles so there are no more than 1-2 strings of hair rooted at a time. 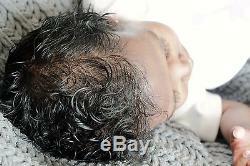 Lakiah's hair has lots of natural. Waves & curls throughout her head, sh. E is rooted with mohair. 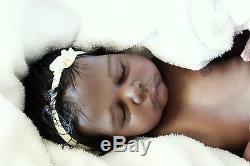 She also has a very find painted hairline & lots of details all over her face; it looks so real. She also has a very find painted hairline & lots of details. All over her face; it looks so real. Painted 3D & rooted eyebrows and eyelashes, which is the same color mohair. She has closed with beautiful rooted mohair eyelashes. Her nose is closed, but is painted in away of death. That gives an effect of deep nostrils. She has a belly wi. Th a girl private part. She also has silicone fat in her belly for extra softness. She also has really nice veining that is very settling to the eyes. There's lots of cool effects with all the shading and shadowing also. With my own talents, I reborn these kits. That help bring them to life. I put an undertone that gives my reborn the special effects. I also use many different layers. Of paint between baking to give them a more realistic look. She has a light moist look they don't look overly gloss and her nails as well. My babies have beautiful skin and are sealed with genesis varnish. The mouth and nails are sealed with varnish and with glazed. She will go home with. Playtex Nurser Porte-sac 4oz Bottle. With fake milk and the nip is sealed. Wolf Grey / Vivid Pink- cool grey Loup/Gris Frais/ Rose Vif. Jordan 12 Retro Gift Pack with the cap size 1. Jordan 3 Piece set with 1 Pair of booties, bodysuit and cap size 0/6 Months. 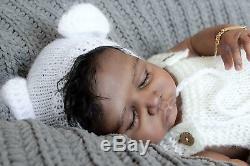 2 piece grey Jordan sweat suit size 0/3 Months. Jessica Simpson Sweet Dreamer 2-Piece set size 0/3 Months. 2 piece purple Jordan Outfit with. 3 piece light pink and gray, long sleeve shirt, short sleeves white & pink bodysuit and grey pans. 10K solid yellow gold stud balls earring size 2 mm & cubic Zirconia earrings 2 mm. 18k Gold Filled Figaro Link ID. Clothes are both new & used. She will go home with everything in the last photos. All of my babies are packed securely and will arrive safe and sound to your home. 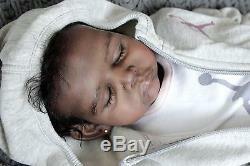 The item "Ethnic AA reborn-Lakiah Prototype #2 prototype Gaby Gail sleep by Claire Taylor" is in sale since Thursday, May 25, 2017. 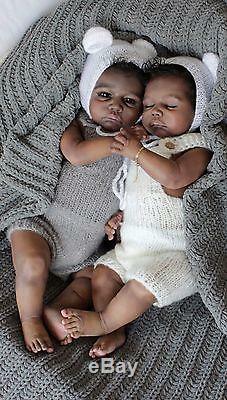 This item is in the category "Dolls & Bears\Dolls\Reborn\Reborn Dolls".nursery" and is located in Phoenix, Arizona. This item can be shipped worldwide.